Poor little fella all plumped up trying to keep warm! Love the Haiku. Thanks. Robins have a way of returning a bit too early each year. Ah, so sweet. I love how the befuddled robin is color-coordinated with the scenery. Such a beautiful photo! And often other friends come with them! a really stunning photo, icy but that’s okay here … love how he blends in with his surroundings all so delightfully colour matched, perfect! The colors were a lucky coincidence, given the winter palette of the foliage at the time. you could not have staged it better Sandy, well done! Lovely! Little robin all puffed up in the cold. Is he wondering if it will ever be warm again? Or is he just living in the present moment? Hard to tell. Maybe a bit of both! Great shot! I never see robins in the winter, even though they don’t migrate and hang around all year long. Lovely photo. Amazing how they survive in such cold weather. They have a few tough weeks, as they tend to migrate into the area prematurely and get caught in winter weather. And the unpredictable and extreme weather in so many parts of the world must make the situation for many birds even more precarious than usual. I think that’s probably true. And the extremes are unfortunately likely to wipe out species unable to adapt. What a wonderful shot of a beautiful little bird. Spring is close, little bird! Yes, hang on, for more snow is coming! LOVE that one. The coloring, the poor little plumped up robin. A great picture. Thanks so much. He does seem to be rather at a loss. Love the photo and words, especially “warmth a distant memory.” So true today! Thanks, Anne. Yes, robins are fun to watch. They like to tag along behind my husband when he tills the garden in the spring, hoping he turns up some juicy worms! Wonderful words and the photo is stunning! 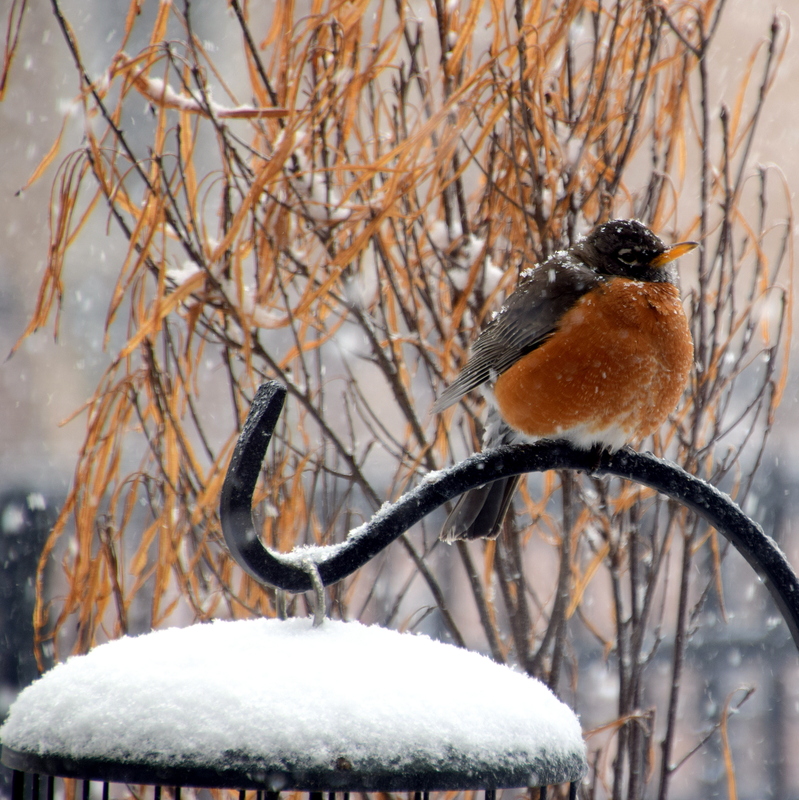 The robins were unhappy yesterday for sure, with 55mph winds, snow and ice. Thanks much. I appreciate your comment!